The apprenticeship levy should not be limited to large employers, according to the senior government vocational education adviser who first proposed it. She told the subcommittee on education, skills and the economy on Wednesday (June 8) that it was “very odd” that the levy, which is due to be introduced in April 2017, will only be paid by employers with a payroll of at least £3m. The professor, who is also part of Lord Sainsbury’s panel looking into technical and professional education reforms, continued: “Nobody in government has given me an explanation, and why would they? She said she had “asked people”, and nobody had “given me a good explanation of this or a coherent post-hoc rationalisation of how that will actually work”. Professor Wolf stressed that she found this worrying. “If you’re going to have a proper apprenticeship system, and one that’s attractive to young people, you’ve got to get small and medium employers involved,” she said. In response, a spokesperson for the Department for Business, Innovation and Skills (BIS) said: “The levy will put apprenticeship funding on a sustainable footing and improve the technical and professional skills of the workforce. The spokesperson added that BIS was still consulting on the issue. Later in the same session, Martin Doel, chief executive of the Association of Colleges, accused the government of “very much making policy on the hoof”, rather than rolling the levy out “in a considered, properly pacey way”. The inquiry, chaired by the MPs Neil Carmichael and Iain Wright, aimed to probe the merits of government reforms amid the drive to increase take-up. 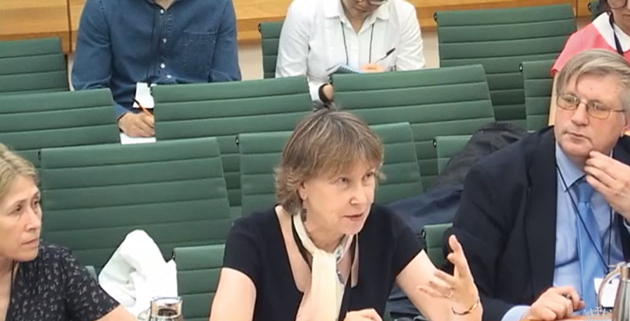 Alison Fuller, professor of vocational education and work at the University College London Institute of Education, also told the panel that uncertainties over the Institute for Apprenticeship were causing concern for employers. She said: “We’re not sure what the functions are going to be, and it’s all very uncertain. Professor Wolf was also asked about the delay to the publication of Lord Sainsbury’s report, on which FE Week has previously reported. I think for the first time I find myself agreeing with Alison Wolf – but she is wrong (again). Conceptually she is right to suggest that all employers,not just those who are above an arbitrary size barrier, should basically pay for apprenticeships. Apprenticeships are at their root a means of investment on the part of employers, in their future survival, competitiveness and prosperity. An investment for them to make. One which many – albeit too few – have always made and are still making. In an ideal world there would be no need for the government to get involved. However as employers stopped making their investments during the 1970s and 1980s, the threat and impact on the national economy demanded that the government step in to deal with this ‘market failure’ and in 1994 following a proposal from the TEC National Council, Modern Apprenticeships were born. Sadly this necessary intervention was perceived indeed promoted as a government programme, thus shifting the responsibility away from employers. Shifting this responsibility back to employers is therefore the correct ultimate answer. But not in one go, especially as apprenticeships are now growing into such a massive exercise to the benefit of everyone, not just employers. So the first step in introducing a levy on the largest, represents a reasonable way to start. It would be nice though to have a simple understanding of how the arrangements are to work – or have I missed something? So yes Alison is right in her overarching logic, but way off in her suggestion that such a move should be made straightaway. To move the culture of UK employers so far will take perhaps a decade or more, and the government cannot afford to let them fail again as they did in the 70s and 80s. Oh yes, where else do I disagree with Alison. English and Maths! GCSE’s are not the only measure and still less the only route. The practical use and application of literacy and numeracy is essential, not the passing of exams. But then I sadly recognise that too many successful academics do not understand this , nor value the whole concept of Work Based Learning that they view as subordinate to the academic route they are comfortable in and with. And indeed a threat!